Cooee! I see you’ve stumbled across our little tea-party. We’re having chocolate cake, millionaire’s shortbread, Swiss roll, custard tart and cookies. But only two cups of tea between six guests. Oh dear. I’ve made this diorama to bring with me to UK Web and Mini Comix Thing on 27th March. I’ll add some more cups of tea before then. Also some more guests. 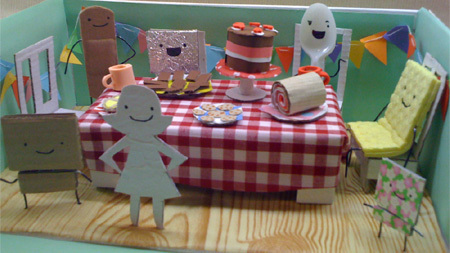 Which additional My Cardboard Life characters will be invited to the tea-party? I don’t even know yet. You’ll have to come and visit me to find out. I’ll be at table 7 with some My Cardboard Life mini-comics and badges, and other items along those lines. And you know what else… there’s a fun game called DINO-SAW-US which begins at UK Thing 2010. You can pick up a free passport, then visit the participating artists at the convention and collect stickers to go in your passport. Visit the DINO-SAW-US blog to find out who’s taking part. Awesome, my cardboard life in 3D! You should totally make pillows/plushies next! A pillow of Cardboard Colin’s head? I reckon I could do that. It’s definitely the right shape. This is fantastic! Will there be pictures of the updated diorama for those of us that can’t make it to the UK? Oh yes, I’ll certainly take some pictures. I wish I lived in the UK — or could travel there quickly without money — so I could visit you and see the finished product! I do hope there will be pictures. The diorama is so adorable now; can’t wait to see that finished product. Love the wood floor too, heh heh. I’ll bring the diorama to other conventions too, and maybe one day I’ll be at a convention that you can get to. So you might well get to see it one day! I think Polar Bear should come along! I’ll send him an invitation! This is the inverse to the situation at the March Hare’s tea party in Alice in Wonderland: Pauline will shout, ‘New cup!’ and everyone will move round the table by one chair, but they will only actually get a cup 2 out of every 7 times. This is brilliant! Very pretty! If there were many more of these made I would SO buy one!!!!!!!!! And I want one please. So come to Canada next! Hurro, saw this at the Thing yesterday, it’s really cute! D: i never had that idea before!